I regularly devise and lead workshops, choreographic courses and profesional trainings for divers institutions in France and the UK. In 2018/19 I am teaching at the Centre de Formation de Danse Désoblique, in Lyon, offering improvisation and composition sessions. I regularly teach profesional training for diverse institutions (ProDance Leeds and The Place in UK, Le Pacifique / CDCN Grenoble in France). In the Autumn 2018 I led the ‘Atelier du Lundi’ at CND-Lyon (sessions of movement exploration and experimentation) in relation to my new creation BROUHAHA. I was associate lecturer in Choreography at Birbeck University in 2012/13 and visiting lecturer at the National Centre for Circus Arts in 2015. I hold the French State Diploma (DE) for teaching dance, obtained at CND Lyon/ Rhône-Alpes. 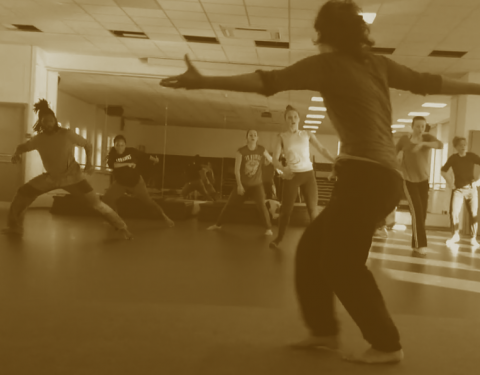 I have led dance classes for the ESPE (Superior school for teachers and education) in Lyon in 2014 et 2015.